Do you work for Nimble? "Nimble lets you be social, no 'sell'"
I am motivated by the sales funnel. It keeps me calling my clients because I like to see deals in the works and deals won! I really enjoy having my clients all together in one place. I like being able to see the emails and social media profiles. I am already making connections through LinkedIn where people are following me and calling me for potential business. There is limited personal time available. 15 minutes per week is not enough, especially when starting out. That is really only enough for maintenance when you are already up and running. I still do not feel I have fully implemented the product as a result. There could also be some improvements with being able to alphabetize clients. The email function would be better if it would sync immediately, like other programs do. So far, only some of my emails sync and only some send. I don't fully trust it yet. If you are not a techie, like me, use the onboarding help and once per week help. I wanted more personal help than that in the beginning to get set up because these types of things are challenging for me. However, once I got set up it has been super easy and the team is always available. I am enjoying the product. Nimble has helped me by bringing all of my clients into a digital format. I no longer lose files or misplace them. I am motivated by the sales funnel. I always knew I had possibilities int the works. Now I can see them and it keeps me motivated to make the calls, follow up, and finalize. Nimble is helping me to increase my income as a result. "Nimble has a very powerful CRM"
Something we like about nimble is its good integration of marketing automation, and its broad integration capacity to major social networks, such as Facebook and Twitter. We like very much the system of calendars and reminders that he offers us, as well as his capacity to carry out marketing by email. Nimble has a good system for tracking customer interactions, and is excellent for importing and exporting contacts. We do not like the fact that with nimble we can not store our documents, and also that we are not allowed to make assessments to our potential clients. Nor does it allow clients to be managed by territory. Nimble does not allow us to directly manage sales force automation campaigns, or communication channels. It also does not allow us to manage commissions, or follow up on recommendations. Nimble is a platform of the most advisable for the management of clients, and to review our relations with them. We highly recommend your business plan, which costs only $ 25 per user, and we recommend reviewing your webinar system, with which you can get more out of the potential of the platform. Now, before, it was a bit difficult for us to organize our email marketing campaigns, as well as managing our sales force automation opportunities. Now we are more quietly organized, and it is easier for us to do all that. Nimble has benefited us a lot by allowing us to do so well the sales pipeline management, with which we have a better control than before. "Nimble is excellent when it comes to organizing teams"
Nimble is simply perfect for handling contacts, since its platform is optimized in an excellent way for this. Its email marketing tool is also very good, and it offers an excellent sales pipeline management, quite focused on taking complete control of each funnel independently. Its integration to social networks also we like a lot, mainly when it comes to Facebook. Nimble lacks many client management options, whether they are health, real estate, or Mac customers. Your CRM does not allow you to store documents or evaluate potential customers. Neither offers an internal chat integration that is stable, or a good management of budgets and offers. Your calendar system is not customizable enough. Nimble is completely recommended to all types of SMEs that want to focus on keeping a more delimited and organized control of each task, because this tool is very portable, and useful to set work goals. We also recommend quite nimble for their orientation towards group work. We love. In the past we had quite a lot of problems not only with our management of customer relationships, but also with the automation of the sales force. Currently nimble helps us a lot to carry out marketing campaigns by email, and to carry out forecasting (sales forecast, to be clearer). In addition, we now have a much more organized customer database management. "Nimble is perfect for managing sales funnels"
What we liked the most about using nimble was its ease of handling prospection tools, which make contact management quite extensive. In terms of contact segmentation, and tracking your interactions with us, Nimble is the best. It also has an excellent integration of marketing automation. We do not like that nimble does not allow storing documents directly, so we usually choose to use external hosting services (in our case, dropbox). We do not like that it does not allow us to manage clients for banking, real estate, or banking. Nor is it good for managing sales force commissions and automations. Your sales management in the field is quite limiting. Recommended nimble for its high quality to handle potential customers, and for how easy it is to improve workflows and sales force automation. Its contact import system is highly recommended to use to import databases from Microsoft office, and its calendar of activities makes it easier to coordinate as a team. Nimble has helped us solve many problems with the use of email marketing, and to properly manage sales force automation opportunities. We find it quite excellent, and now we are in better contact with our customers, since their channel system is very useful. Its task creation system helps us work more neatly. "Nimble offers a charming social media management"
The Nimble sales pipeline management system is fast, and very easy to use. It is very fast when it comes to managing contact databases, which are easily importable from Microsoft excel. Your marketing automation integration is amazingly fast. It does not allow to store documents internally, nor to make a quality evaluation and great extension to our potential clients. Its system of tools for prospecting contacts is excellent, because thanks to that we can make good follow-ups. Nimble is highly recommended, mainly because thanks to its use our team will be much more organized, and we can also take better management of our customers, which will create better sales strategies in the future. Recommended for small and medium businesses. Nimble has benefited us excellently in the matter of enhancing our relationship with customers. It offers a good task manager, and a wide integration of social networks, with which we take great advantage of them. It is very good also for the application of email marketing, with which we had difficulties in the past. ""The Good CRM for Building Relationships and Sales "
1) The simplicity of setting up and getting to be capable in utilizing each part of Nimble's abilities and consistently included new instruments incorporated inside the program is a major victor at picking Nimble for our organization CRM item. 2) The gadget application works astutely inside Safari, Google Chrome, Microsoft Edge and Mozilla Firefox to pull all the Social Media data in addition to utilizing the Prospector getting other telephone numbers and addresses about a key contact individual or the organization itself spares me colossal time from going one-by-one to fill all fields physically with that particular data. 3) The Customer Support group is superb and completely fit for dealing with high need issues quickly and for tuning in to the clients for input and new thoughts. Not so much an aversion, yet all the more an ideal component not at present accessible is to have an immediate incorporation to Constant Contact from inside Nimble. That coordination of Constant Contact contacts pushing imperative connections, for example, what email crusades they have opened, tapped on what joins from an email battle, went to an occasion on the web or face to face, tapped on a connection of a post on Facebook, asserted a Trackable Coupon, and additionally made a gift to a non-benefit occasion or non-benefit association. How unimaginable would that be versus some other CRM application out there because of how Nimble is planned and keeps on finding new capacities to present that upgrade an officially extraordinary program. On the off chance that you are in the matter of offers, selecting, planning volunteers, arranging church pledge drives.. or then again ANY OTHER sort of prospecting for individuals, you have to look at Nimble. It is too simple to set up and work with in any case your specialized capacities and will (*FINALLY*) be an instrument that works FOR you in gathering information and discussions that you're ALREADY having around the web. 1) Eliminating sat idle physically entering basic data on every Social Medium stages, organization sites, LinkedIn profiles, and more that Nimble can amazingly recover and embed into the individual or organization contact records. What an extraordinary method to start constructing genuine important collaborations with potential clients and continuous with current clients. 4) Using the Group Messaging apparatus to convey email messages that take into account personalization of substance from fields inside the contact record that tracks Open, Click Rates, and Unopened numbers. "Nimble fully automates your sales force"
We like how easy it is to manage customer databases with Nimble. It is very good to generate sales force proposals, and to make marketing campaigns by email. It has an excellent ability to segment customers, and the ability to import contacts as external documents. We dislike the fact that Nimble does not have an internal chat integration, nor does it store documents on its own, without the need for third-party hosting services. It does not allow us to manage budgets and offers, or make assessments to our potential customers. Nimble is recommended to all types of SMEs, mainly if they need contact prospecting tools, or if they are looking for a CRM that allows them to properly integrate into social networks. It is also highly recommended to review all sales force automation proposals you have at the time. Nimble has made it much easier for us to segment our contacts and follow up on their interactions with us. Before we had problems to organize our sales pipeline management, but thanks to the practicality of Nimble we have solved this. "Nimble oversee and manage all my business relationships"
Nimble is a great platform has helped me greatly in my organization I use to oversee and manage all my business relationships. From customers to potential customers and much more. The ability to monitor and respond to email and social networks makes it my everyday application. Group emails, email templates and integration with tools like LinkedIn have made organization advance to the next level fast. i haven't had many problems with this software, but i had a mishap like for example they only allow 30 people in group messaging. they need to work on the structure of the leads - as well as tie their tags to be in sync. and improve their interest a bit. excellent platform I recommend them you need to make sure you synchronize all your social media accounts and emails so that everything is well in my organization has been very helpful. I've synchronized several emails and I love the fact that you can see the profile user communication that you add to Nimble. We use it in our organization and best of all is that we have all our contacts organized in one place and is accessible from the cloud, so basically we can access it when we work from home or when we travel (in the application) as long as we have access to the Internet. This makes it a great tool. I use the customization functions all the time and the ability to extract the data is very important to me. Group messaging has become a feature I use every day. "The BEST CRM for Building Relationships and Sales with Social Media Intelligence"
1) The ease of setting up and becoming proficient in using every aspect of Nimble's capabilities and continually added new tools integrated within the program is a big winner at choosing Nimble for our company CRM product. 2) The widget application works intelligently within Safari, Google Chrome, Microsoft Edge and Mozilla Firefox to pull all the Social Media information plus using the Prospector obtaining other phone numbers and addresses about a key contact person or the company itself saves me tremendous time from having to go one-by-one to fill all fields manually with that specific information. 3) The ease of integration to my Google Calendar, using Piesync to push a new contact entered into Nimble to Constant Contact or vice-versa or from Nimble into QuickBooks Online or vice-versa is the best time-saving integration possible. 4) As of 2/17/2019 the newly enhanced Activites management page that can be arranged into the specified fields of data you wish to view, use tags to segment items you wish to review based on the type of activity items are available in such as Agenda, Tasks, Activities List, and Calendar. 5) Having all of these tools (and much more) interacting and usable within Nimble permits me to stay in one program to do 85% of my daily work. 6) The Customer Support team is excellent and fully capable of handling high priority issues promptly and for listening to the users for feedback and new ideas. 7) I am also very excited about the ongoing and new additions that Nimble (primarily Jon Ferrara) worked very closely with Microsoft to grow Nimble's reach to more markets. Now we can easily integrate with Office365 Calendaring and Outlook. 8) Plus the very effective Search Segmentation tool that provides innumerable ways to create and save filters, segments, groups, locations, titles, and any combination of these. Then you can use these to create group messaging campaigns, export lists for use in bigger email promotion campaigns and to pull a segment to have access for an upcoming visit to a trade show or prospecting certain people while a particular city. 9) The continual widget add-ons being provided for the Today Page provide valuable and immediate insights into Tasks, Contacts needing a touch via email, phone calls, DM, LinkedIn, Facebook Messenger or any other tool, Email tracking as it shows opens and clicks, plus viewing the nurturing and relationship sales journey via the Pipeline and Funnel visual charts make for a robust Today view that means something all in one place. 10) The latest integration addition called OMI 366 Degrees has made Nimble so much more powerful by providing instant ways to set up AI, Autoresponders, plus so much more that builds a lot more about your contacts interests, questions, calls to action interactions, and so much more. Not really a dislike, yet more of a desired feature not currently available is to have a direct integration to Constant Contact from within Nimble. That integration of Constant Contact contacts pushing important interactions such as what email campaigns they have opened, clicked on what links from an email campaign, attended an event online or in person, clicked on a link of a post on Facebook, claimed a Trackable Coupon, and/or made a donation to a non-profit event or non-profit organization. How incredible would that be versus any other CRM application out there due to the way that Nimble is designed and continues to find new functions to introduce that enhance an already great program. Talk to an existing user, like myself, to gain insights that may answer your questions based on your business needs. Try it out for the 14 day Free Trial take it for a simply Nimble spin. 1) Eliminating wasted time manually entering critical information on all Social Media platforms, company websites, LinkedIn profiles, and more that Nimble can automagically retrieve and insert into the person or company contact records. What a great way to begin building real meaningful interactions with potential customers and ongoing with current customers. 4) Using the Group Messaging tool to send out email messages that allow for personalization of content from fields within the contact record that tracks Open, Click Rates, and Unopened numbers. 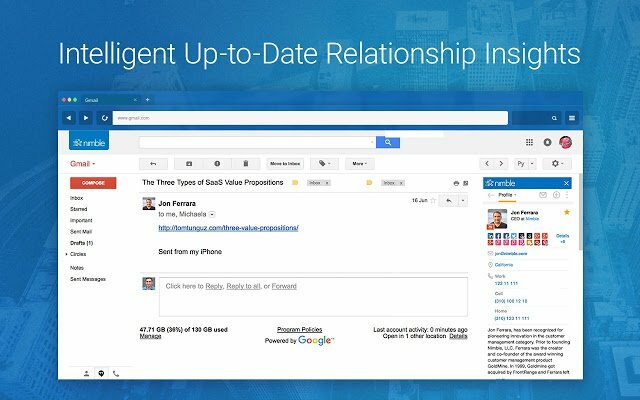 6) Actively involve the use of the Prospector tool that allows me to look deeper into the information world by finding more phone numbers, email addresses, and other notable contact options to better enhance the potential for relationship interaction. 7) Fully taking the advantage of the widget filled Today Page. With pertinent and focused purpose each widget gives me a quick view of areas needing attention, finding out about sales progress, highlighting contacts that meet my pre-determined keywords or phrases to bring them to the front page, and scheduled Tasks to help plan the day. What I like best about Nimble is that you have a pathway to connect in autuentic ways that previously took months, weeks, or years. Now, Nimble allows you access to the inroads in a few focused clicks. I'm new, so my current dislike is navigating the newness and architecture of the systems. Give it a try! It's hard to imagine how this type of systems cound't help almost any type of organization that wa trying to make powerful connections into the depth of the market you're after. The best problems being solved are the shortening of the sales cycles for larger accounts. By having easy and manageable access to the key players in the companies that I work with, I have what seems like an unfair advantage. Also, I find out quickly that people are connected to key contact outside the target accounts, thereby giving a deeper human connection - and creating authenticity and trust. This kind of depth in connectivity used take years - IF you were lucky. Now it's available in short order. 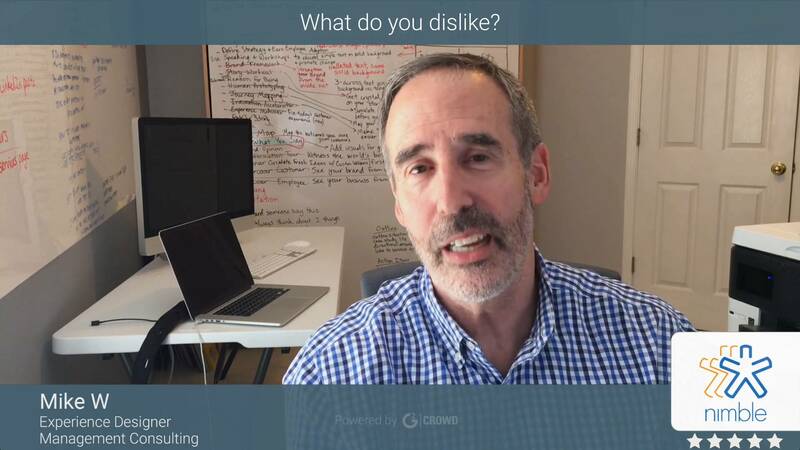 "It's more than a CRM... It's a Relationship Building Portal!" Nimble is the platform I use to monitor and manage all my business relationships. From Customers to prospects and more. The ability to monitor and reply to email and social media makes it my go to app every day. The group emails, email templates and integration with tools like LinkedIn and 366 make it so easy for me to generate new business it's almost a no brainer. I wish it would have a deeper integration into more social media platforms so I could post and respond to Facebook, LinkedIn messages and so on! Start slow. It's tempting to import a bunch of contacts. Take the time to make sure each is current, accurate, and organized. "A Great Tool for Growing Business, Organization and efficiency." Organization by Company and the ability to show all communication for that company easily. I like the fact that I can make pre-drafted email templates that add in users names, roles and company to make the email seem more personalized. I've found that I have save a ton of time by having these templates. I also like that I can link a contacts profile to their social media account so I can put a face to the name and quickly refer to their LinkedIn account. Additionally, I like that t automatically pulls information on the company, such as revenues, CEO, etc. I also like the filters that can be applied. The tagging function is extremely versatile and gives me the ability to create a bunch of different filters based on what I'm looking for. I wish that there were drip campaigns available and that the I could more quickly get to my task. Right now there are too many clicks required to get to the beta version of the activities. If I could add a campaign with auto task and auto emails to clients, I would save a ton of times manually adding phone calls and email task to remind myself to reach out to the contacts. I am able to stay organized by using Nimble. I can quickly pull up what quotes are in what stage of the sales funnel giving me the opportunity to follow up internally or ask the customer for feedback. Beyond the use of Nimble of prospector providing the needed intel to find contact details for influencer outreach, the Kred scoring that's also in place was very handy for certain considerations. How it helped not only for reaching out to "prospects" (customers and influencers alike) but provided me with data for content writing. The functionality of other product features not well and clearly communicated, to entice me to explore its utility. It's the nimble prospector so far that I have fully enjoyed. Beyond "prospects" customers and influencers are reached better with good intel in Nimble. And how that intel can be mined for content strategy is what the platform actually offers. When doing an influencer outreach, beyond finding the email of "prospects" the verifiability of the contact information is most useful. I've benefitted much from its accuracy, when I get less email bouncing back as "undelivered mail." "Nimble is a must have for Sales Navigator to be useful"
I love being able to get contact information for my social media leads. I find Sales Navigator to be almost useless without using it along with Nimble. I dislike that I can only find contact information if the Company Name is used. I wish to algorithm could be updated to search based on the social media handle if you do not know the company name. I have been unable to figure out so far how to integrate my email client so that I can send emails directly out of the platform. I have prospected other systems with an AI model, and this one was by far the best priced. I am able to prospect more people out of linked in without using all my inmail credits by finding their email in Nimble and contacting them directly from my mail client. "Great CRM - Email Tracking, and nice interface - working on group messaging and lead mgt improvments"
I love Nimble for its ease in emailing my leads, and also for tracking the emails - i love the smart tool they have which is unique to them, their interface is great as well. Their customer service is about a 7 on a scale of 1-10 ---sometimes they are really great, as long is its within certain hours -but on weekends there is no customer service. I dislike that they only allow 30 people on group messaging, to me that is not group messaging.... that is a group message. I also feel that they need to work on the leads structure - as well as tying in their tags to be in synchronization. I think most people will love it, the price is right, and its a great -almost perfect crm. I am way more organized by using crm and lead organizational. "Great software for a small business"
I use this software on a daily basis and it's very convenient. I really like the integration of social profiles like LinkedIn. All our contacts are in the cloud, so even when our employees are traveling, they can access Nimble through the app on their phones. My experience with customer service is great. If I encounter any problems, they're available and they try to work with me and solve whatever needs to be solved. Although I enjoy the integration of social profiles in Nimble, it's not always correct. Sometimes phone numbers are added to a contact, because Nimble finds it in the contact's social profile. But those numbers are not always correct, because people don't always keep their LinkedIn profile up to date. This gets kind of messy at times. I have tried to delete the numbers but it will show up again the next time. The only solution is to un-link the social profile if it happens. We've been using Nimble for about 1.5 years. The best thing about it is that we have all our contacts organized in one place and it's accessible from the cloud, so we can basically access it when working from home or when traveling (on the app) as long as we have internet access. This makes it a great tool. "A CRM that offers a solid product at a great value"
I manage our sales efforts in the customer relationship management system. We are constantly contacting new clients and we need to keep track of all different kinds of work flow with the customers. I realized we are a business that uses Nimble and benefits from the easy to navigate place for sales management. 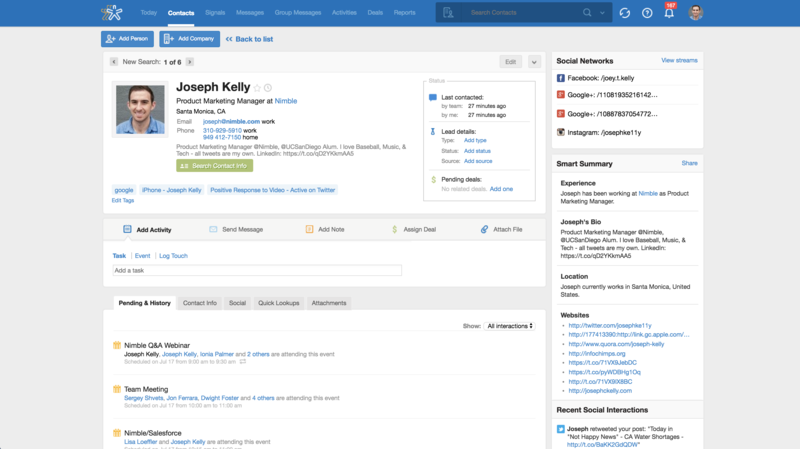 Nimble is very intuitive also with the Prospector tool and the social CRM widget. Your time is valuable and the time to demonstrate this agility tool for your business can result in increased revenue growth, in addition to invaluable relationships. Interesting application. Some basic features for contact management are missing. look for duplicate contacts, integrate with the phone and calls to contacts, among others. Today does not justify the payment. Nimble saves me 5 to 10 hours a week by automating prospecting and research through the Chrome plugin and the new prospecting feature. The return on investment was immediate. Thank you Nimble for returning to our company our most valuable asset Time. "Digital Marketer & Growth Hacker In LOVE w/NIMBLE"
Nimble collects everything I need or want to know about someone before reaching out beyond my automated systems. It allows me to get a full and robust picture of the person I'm going to extend myself to and allows me the opportunity to vet them as a true match to my buyer personas and services BEFORE wasting anyone's time talking to them. Because I am responsible for a SaaS start-up's marketing and branding now.. to which is currently entering a growthmode, I am desperate to find more information about our 40,000 users in bulk. I wish that I could drop the email addresses into Nimble and instead of finding data one user at a time, perform a bulk operation that could then be reported upon. My client never collected user data as he started out and grew... Now we are in a pinch and wanting to identify our ideal customer. 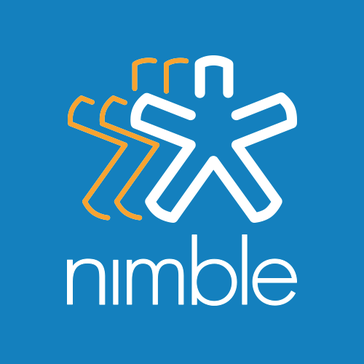 If you are in the business of sales, recruiting, coordinating volunteers, organizing church fundraisers.. or ANY OTHER type of prospecting for people, you need to check out Nimble. It is super easy to set up and work with regardless your technical abilities and will (*FINALLY*) be a tool that works FOR you in collecting data and conversations that you're ALREADY having around the web. Simply stated, you need Nimble CRM to improve your quality of prospecting and lessen the quantity of people it takes to get it right. Nimble takes the place of many different platforms I have used in the past to pull intel together on prospects. It's all done in one place by one system. take advantage of the trial - really use it. keeping all contacts in one place, tracking emails, looking at a consolidated calendar. ability to enter notes, events, tasks in one place. I use the customization features all of the time and the ability to pull the data out is very important to me. The group messaging has become a feature I use daily. "The only CRM I have been happy to pay for, ever"
Nimble saves time. You can add people and companies to Nimble without any typing by using its widget when you are either browsing or in your email system. I haven't come across that in any other system. It quickly builds social profiles around your contacts saving you having to do the research. It supports multiple email accounts so you can, for instance, mix business with personal in the one database and use the database as your dashboard for communication and calendar etc. for different aspects of your life. You could run multiple businesses from the one database. It tracks emails and is perfect for relatively small personalised email marketing campaigns. I like the fact that you are notified when someone opens an email that you have sent. Several times a day the phone will ring just after that alert and I will be totally prepared for the call which increases the chances of the right outcome. The mobile App is not that great although it has helped me on occasion. It requires good connectivity which I don't enjoy in my location so may well be great in the big cities etc. Having said that, the recently updated Mobile 3.0 addresses most of my concerns. Try it out. Install the widget and add contacts from your browser or email system. If you are happy with it and become a subscriber then import your contacts from other systems. I am quickly able to see to what extent my contacts are using social media. For those that are active I can see what interests them and that enables me to break the ice when I contact them. I have won business using this technique. It would be a pain to do this manually, and I suspect that is exactly what most people do because their CRM does not help them. "A pleasing interface and surprinsingly good functionality"
As my title indicates, I've found Nimble's strong point is its interface, as it compels you to keep everything written down while maintaining a playful appearance. The immediate feedback you get from annotating different aspects of you upcoming workdays is conducive of higher productivity, even if it's effects are not obvious. As a sensible person in regards to the overall atmosphere at work and within my work platforms, this is very important. While good looking, the interface can get really crowded if you're using it on small screen. That means it's impossible to get the information you need from a quick glance at the screen, making Nimble lose one of it's purposes. In my honest opinion, Nimble is worth at least a try for most of you if you can pass some power user features for a more user friendly interface. Keeping everything written down and easy to access, from the status indicators of my business to my appointment list and everything in between. At the same time it allows me to keep my contacts grouped under a single platform giving me almost everything I need to keep track of all the variables I need to use at my work. "Pretty good so far. We are still tapping into its potential." 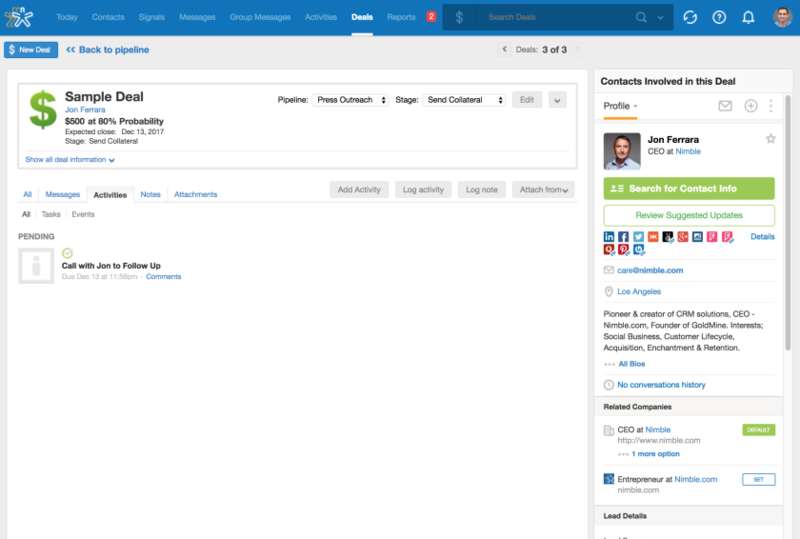 I like that Nimble is in the cloud, it updates quickly, and is easy to input new contacts. I do not have an unlimited number of emails I can send at once. I have over 400 Former Happy Clients, but I am told Nimble will only allow me to send out 100 per day, and it seems that only 30 were sent out the first day. From 2004 to 2014 I had the Goldmine system which allowed me to stay in contact with 1, 500 contacts. When that system finally collapsed under its own weight, I switched to Outlook which did not allow me to easily stay in touch with my contacts. Now in 2019, with Nimble, I can once again stay in touch with my contacts. Thank you! "Nimble CRM - Simple but Powerful for small businesses"
Ease of setup - there are a few steps to do per user but these are straightforward enough. Once you are set up correctly in can be astonishing to see a rich client record created just from entering an email address. Ease of use - Nimble is very fluid in how you use it and you can create your own workflow very easily. You can also create detailed Sales Pipeline Workflows if you need to be more disciplined in your approach to sales. This is known as Deals in Nimble and we find it works very well even with a less rigid approach to sales management. And now the Today Dashboard shows a Deals / Sales Funnel graphic which is great. You get a quick daily visual of what are in your sales stages and what you need to keep on top of. Segmentation - Tags and Saved Searches are super-powerful. You can get very granular on how you categorise the Companies and People you deal with. I think this sets Nimble apart from so many of the other CRM systems out there in terms of it's search capabilities. Really impressive! This links with Group Messaging / Email Templates and allows you to send out highly targeted email campaigns to smaller groups in your list within seconds! Then you can watch as people open your message! We are experimenting with a third party UK cloud phone software app that links to Nimble and and will date stamp and optionally record conversations. Watch this space!! I would like to see more in the way of consolidated Reporting for Activity Management for Teams. At the moment you can look at an individual sales person's activity list for the day, or past/future but it would be good to get a Team report which can breakdown activities to analyse who is and isn't performing. Hopefully something like this is in Nimble's future as it will put it on a par with some of the more formal CRMs whilst keeping it's fluid nature. It would be good if Nimble had a way of tracking larger companies that have subsidiaries i.e. Parent Companies. This doesn't appear to be supported - for instance, large hotel chains. I get round this by putting the name of the group into the company field then including the local hotel name. Please give Nimble a try and dedicate some time to using it. We are more organised with keeping in touch with clients. however the best part of Nimble is it's use as a prospecting tool. We have rapidly built a lead bank from simply searching for particular types of companies in Google, looking at the resulting list in Google Maps then clicking through to the different web sites. Then we use the Chrome Nimble widget to add the company to Nimble - it's so quick. I'm a new user but so far I really like how Nimble consolidates and tracks the data about my contacts in a way that I can easily follow and keep up with. I find it very user friendly and intuitive. As someone who doesn't love tech, I really appreciate this quality in a product. Nothing so far. I have a bit to learn about the extensions available and that will happen over time and experience. Nimble is a breath of fresh air creating flow and competence for small business owners new to the process. I get overwhelmed with trying to keep up with potential clients, recording interactions, and tracking who I need to follow up with and when. Nimble does that for me and that is a tremendous benefit for efficiency and productivity. "Nimble creates tremendous efficiencies in sales, business development & marketing "
There are many features we like BEST about Nimble. It is simple and easy to use, very easy to through pipeline and creates tremendous efficiencies, the group messaging feature is excellent way to keep in touch with groups, being able to pull all social media data from knowing the email address is great. LOVE Nimble prospector for finding new opportunities + LOVE the fact you can load Twitter lists into Nimble to begin prospecting. HUGE help in organizing. Love the fact it pulls social media. Use the signals feature a lot in seeking influencers and finding opportunities. 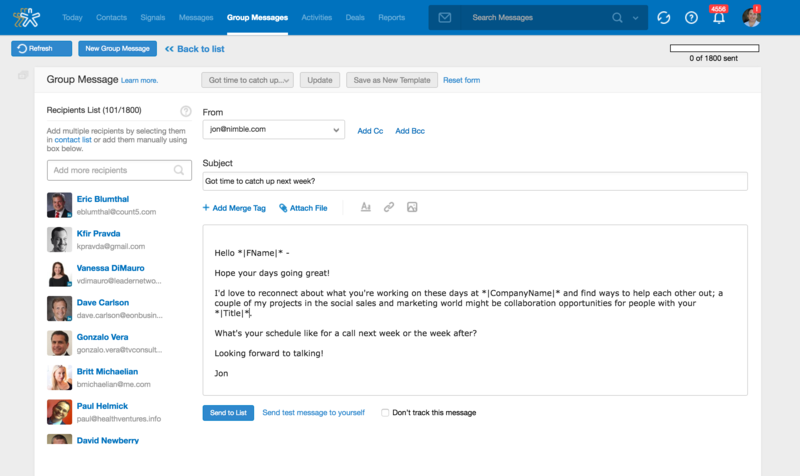 Nimble is by far the BEST CRM I have ever come across or had the please to use. I use it on a daily basis and is the first thing I sign into every day now. There could be some efficiencies created in dealing with the sales pipelines, however it is really cool how you can customize everything. Days in pipeline, name of each cycle of sales pipeline. I have had some issues recently with the group messenger tracking feature that continues to show opened emails from years ago. We used to be able to API to Nimble data via MailChimp now we have to go through a 3rd vendor Piesync that costs more money to do so. Decided we have too many vendors involved (re: budget) so now I just export data to MailChimp by exporting to CSV. More time consuming but I feel by managing via spreadsheets you get higher quality results and easier to take out non-subscribers doing email campaigns. Make sure you synch all your social media accounts and emails. I have synched multiple emails and love the fact you can see the communication per profile user you add to Nimble. For clients: Organization for the Stephen J Wampler Foundation for donations, grants, volunteers, staff and more. It has created tremendous efficiencies for the organization. Building quality sales pipelines for my Client RebelFish Local specific to working with DDS and private practice in handling some business development consulting. I love the search mode that gives me all segments I may need. I love the way it's easy to manage. I would like to suggest an improvement: when I create a task or an event, it would be great if I could tag all participants at once. Nimble helps me a lot on organizing my existing customers (students, actualy) and the prospect ones. I've used Nimble in 2 ventures and it never disappoints. The product is very intuitive. The customer service is the best. Everyone is very nice and seems to go overboard. No, I can't reach them by phone, but what do you expect for $25 a month? Their answers are thorough and they always follow throw to make sure I am happy. I am! I wish the email platform was a little more robust. I can see when "someone" has read my email, but not who. I am VP of a small company. 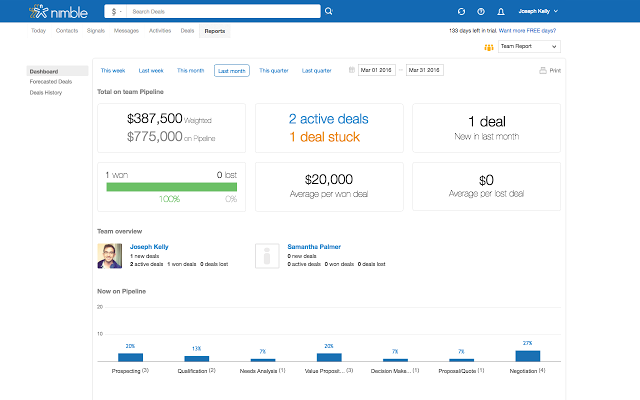 I use Nimble to keep myself organized and to find information on potential prospects. Just an hour ago I showed one of my employees the "Search Contact Info" feature and he was astounded. "A CRM that a Salesperson will actually enjoy using..."
Contacts that get socially enriched which dramatically reduces the need to input and update data. This is BIG. Integration with Office 365 and OMI 366 Degrees. Snappy performance. The ability to do custom segmentation and tagging of contacts. Tasks associated with each contact are convenient and very easy to setup. The iPhone App is actually pretty good and incorporates a convenient business card scanner. Custom tabs and fields both need work. We require this functionality extensively. I understand that additional field types are under-development. We have had so much data associated with each contact that setting-up custom fields was the most time consuming aspect of our migration. Would highly recommend that you give Nimble a serous look. Especially for small to medium-sized businesses. Additionally, Nimble has the ability to work with popular CRMs on the market such as Sales Force and Dynamics. A company may need the customization and features than an enterprise level CRM offers, but can still utillize Nimble to socially enrich contacts. 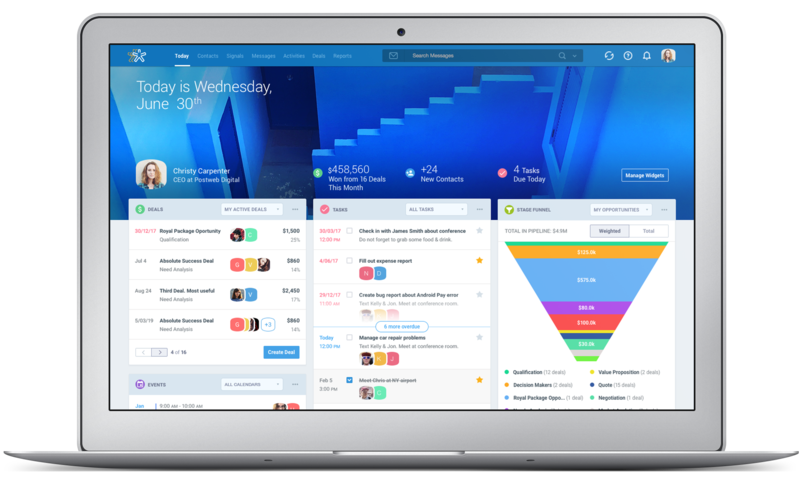 Nimble is our go to CRM, group e-mailer and sales intelligence gathering tool. We've recently migrated from a very well-known CRM, but it in comparison to working with Nimble, it was quite cumbersome. Our previous CRM was very capable, but was not enjoyable to work with on a day-to-day basis. Nimble, though not as feature-rich, has all the features we need and some capabilities that our previous CRM did not even offer. Since moving to Nimble, our contact records and pipelines are now much more accurate and current. This is attributed largely to the ease-of-use and enjoyment of working with Nimble. Plus, Nimble has powerful contact segmentation which allows to do highly focused plain-text e-mails that have a higher open and engagement rate than heavy HTML e-mails. For more extensive marketing efforts, tight integration with OMIs 366 Degrees enables us to orchestrate our social and e-mail campaigns with campaign reports being fed directly back into Nimble. Pretty slick! We weren't planning on becoming a partner, but our firsthand experience with Nimble made it a natural choice. "CRM sencilla y algo corta"
Facilidad para entablar redes de contactos con clientes. Dentro del mundillo la verdad es que es que no está nada mal a la hora de comunicarte con posibles clientes o contactos, es algo que es de agradecer. Un poco corta a la hora de ir más allá en las relaciones en comparación con otras. Si la comparamos con otras aplicaciones que ofrecen el mismo uso, deja mucho que desear, le hubiese metido algo mas de chicha en aspectos básicos en una aplicación de estas características. No la recomendaría, hay aplicaciones que funcionan mejor y muy faciles de encontrar. La verdad es que no me ha sido de gran ayuda a la hora de realizar mi trabajo de una manera eficiente, como ya he comentado anteriormente está un paso por detrás de sus competidoras, quizá su interfaz sencilla ha sido algo beneficioso a la hora de utilizar la aplicación pero muy lejos de gustarme a mí y a mis compañeros. "Easy and flexible; the Best I have ever used. " Nimble is just that Nimble; It's a very flexible easy to use platform that consistently improves. It's linked to social search is an incredible advantage when qualifying any type of client. It's easy to search and find info and you can organize the way you prefer to work. Very little; the mobile view is not all I would like it to be; But all the information you need is there. I do wish it had better links to your cell phone or business phone to dial from the platform. Limited to skype. Give it a try regardless of your industry. It's tagging and search abilities will move with you as a Business Development Professional regardless of your role changes. Organizing various types of prospects for varying business needs. "Nimble: A CRM makes my online activity more productive"
The new Group Email and Email Tracking are fantastic. I can now select a group of contacts and send them a "persoanlised" email direct from Nimble. This is NOT using a 3rd party like MailChimp. The great thing is it tracks who opens it and who clicks on the links. This is great for even single emails for sending a proposal as wells as may an invitation to an event. The new facility also allows you to create different templates. Again this allows for customisation of emails. Then there are features that have been around a while which are also awesome. The Nimble Chrome Smart Widget makes this CRM really standout from the crowd. Providing you are using Chrome as your browser then you can see the all details of a contact in your CRM and contact them with out being in Nimble! And if they are not in Nimble? You click a button and add them to it. You are still not in Nimble. Really working in a CRM and not being in it takes some getting used to. Nimble enables me to see my calendar, email, standard CRM stuff, deals and social media posting and streams in one place. I have used and sold some of the major CRMs. However, Nimble is the only CRM where I spend nearly 100% of my office time in the CRM system. Why, I can send and receive emails, send messages via Twitter, make posts, schedule posts, manage my sales pipeline, create call lists. You can integrate to 3rd party apps like MailChimp, and a heaps of appllications. It is easy to use, its affordable and if you need tech support the Nimble team is fast at responding. The email is a bit basic in that you can't choose a lot of folders. It also has limited formatting tools unlike MS Outlook. The calendar is also a bit basic. However, I use both the calendar and email tools for most purposes. The other benefits far outweigh these aspects. For businesses wanting get staff quickly using a CRM then Nimble is very easy to set-up and use. I know of seniors using Nimble very happily with little training. If your team uses social media to link with prospects, customers and contacts then Nimble is a must. For me the problems solved are seeing the maximum information about a person quickly and easily and adding people to my Nimble CRM at a click of button. It saves me a lot time. The Smart App in the browser and addin to Gmail saves me so much time in being able to update information PLUS send messages, set tasks, follow-up, deals, tags. When you start working with Nimble for the first time, you can automatically synchronize contacts, email, and calendar that allows you to start working faster and attract your customers. It's much easier to manage your events and tasks on the calendar. It is convenient that the program updates contacts with details from social profiles necessary for effective work wherever you are. When working with the program for a long time, I did not find any significant disadvantages for myself. Sometimes there is a little suspension of the program but rarely. Nimble is easy enough and easy to use, it also helps you keep your business under control. I realy recomend it to use. With the help of the program it became much easier to find people and companies that are important for our company. The function of group messages has greatly simplified our work in terms of alert for our customers. Nimble creates an order of the day from my phone calendar, honestly, it's much better and cheaper than personal secretary. "Simple, Usable, Comprehensive CRM w/ Social Media Integration"
Ease of use and simplicity of connection with GSuite and contact social media accounts. Haven't used it long enough yet to create a dislike list. What I particularly dislike right now is they're requiring me to write more in this review. I wrote what I care about. Take it or leave it. This is so annoying for every company that makes you do this. Sometimes a pithy response is better than a book. TL;dr is a real thing for a reason. Give it a shot. It's as easy and reasonably priced as any CRM available today. CRM & Email tracking - As I'm creating new email campaigns, I like know who has opened and sometimes more importantly who hasn't opened the email that I sent.